THIS YBM HOME ORGANIZER WORKS GREAT IN THE KITCHEN: for storage of kitchen Flatware, Utensil and kitchen gadgets, garage or tool shed... the bathroom makeup jewelry station... kids' rooms... sewing rooms... hobby rooms...or tame a junk drawer. Some folks even use them as a shelf organizer. CREATE A PERFECTLY ORGANIZED DRAWER WITH THIS MESH FLATWARE AND CUTLERY DRAWER ORGANIZER: The flatware and cutlery organizers are sized for eating utensils and small kitchen helpers such as corn holders, napkin rings, measuring spoons, spatulas, cooking utensils, knives, and other kitchen items. CLEAN DESIGN. Designed from sleek, lightweight metal wire that won’t collect crumbs and is easy to wipe clean. Dimensions: Upper Length 14.25 in. Lower Length 14 in. Width 10 in. Height 2 in. CONVENIENTLY ORGANIZE YOUR KITCHEN AND DESK DRAWERS WITH THIS YBM HOME DRAWER ORGANIZER. The tray is Sized to fits easily in your kitchen drawer or pantry. The tray can easily accommodate all your flatware, silverware and other kitchen utensils. THIS SILVER MESH TRAY IS BOTH STRONG AND GORGEOUS AND IT CLEANS UP PERFECTLY WITH A QUICK RINSE IN WARM WATER. Featuring five compartments, this ingeniously organizer is sized to fit standard drawers and maximize storage space. This useful organizer is ideal for holding your flatware, cutlery, kitchen gadgets and clearing the clutter around the kitchen. It can also double as a workspace organizer for your home office supplies or cosmetics. Sized to fit most standard kitchen and desk drawers. WITH ALL THE THINKING, PLANNING, DREAMING, SHOPPING, SLICING, DICING, COOKING, AND CREATING THAT GOES INTO YOUR MEAL PLANS, GIVE YOUR MIND THE GIFT OF SPACE. The 5 well-thought-out sections in this Utensil Tray are designed to store and sort, while giving you easy access to its contents, in a conveniently sized drawer insert that feels at home in your kitchen space or any space. 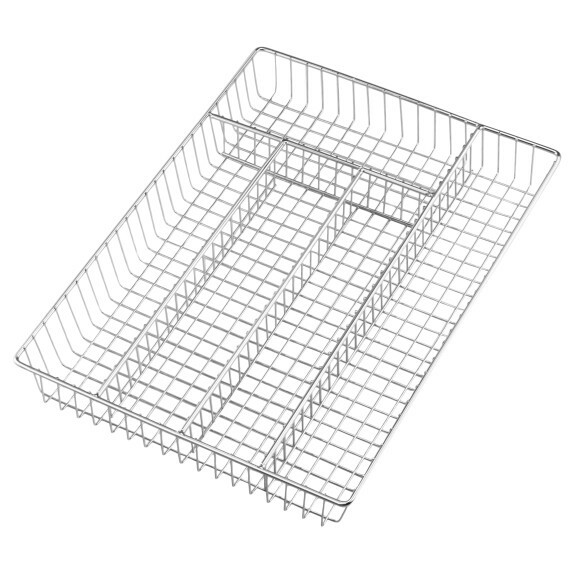 This large and spacious Flatware Organizer will enable you to stay organized in the kitchen. With five sections to neatly arrange your cutlery and serving utensils, you’ll be able to easily find exactly what you need at any given moment. CONSTRUCTED FROM METAL WIRE, THIS TRAY WILL NOT RUST NOR DAMAGE YOUR SILVERWARE. Say goodbye to those dirty grimy plastic cutlery trays. When you use this Flatware Organizer crumbs will simply slip through the mesh construction and your cutlery will remain clean. The organizer can then easily be lifted up and your drawer cleanly wiped out. THE FLATWARE ORGANIZER IS ALSO A PERFECT SOLUTION FOR KEEPING YOUR OFFICE SUPPLIES WELL ORGANIZED. Use it to neatly arrange your pens, pencils, highlighters, paper clips, sticky notes and more. Increase your productivity by always knowing at a glance just what you have and where it is. The chrome plated finish on the Flatware Organizer gives it a classy clean look, a perfect addition to any home or office.